Mac can be equal parts good, bad and frustrating. Their summer collections are typically good, at least the last few have been. Mac knows their summer collections are popular, so you’d think they would be prepared and offer a sufficient amount of products. That’s logical, right? Not in Mac’s world it isn’t. I admittedly had been stalking Mac’s website waiting for this release. The day this limited edition collection was released online, at 9:30am CST, the lipsticks were sold out. Sold out! Seriously!! 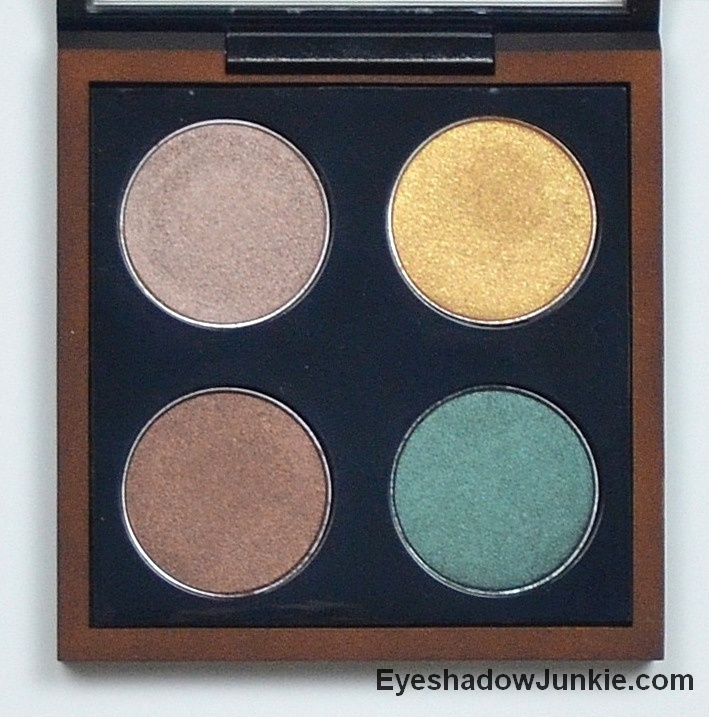 By the afternoon, the eye shadow quad featured in this post was sold out. The blushes were gone the first day as well. The glosses were sold out the next day. Clearly, Mac was not prepared. The collection is released in stores May 23, so there is still a chance to try out this collection. Mac’s Temperature Rising collection is fairly large. It offers lipsticks, glosses, eye shadows, bronzers (powder, liquid and oil), blush and nail polish. I only picked up an eye shadow quad and a gloss. The packaging isn’t the typical black plastic. It has a soft, satin finish in a dark bronze tone. 1. Romantico (veluxe pearl) is a brown taupe. It is in the infamous Mac Satin Taupe family, but this shade is warmer and Satin Taupe is more purple. 2. Bare My Soul (lustre) is a somewhat soft yellow gold. It looks more vibrant in the pan. Mac’s Goldmine is more yellow and intense. 3. Friendly (veluxe pearl) is a chocolate-brown. Mac’s Make Your Mark is similar. 4. When In Rio (frost) is a deep green with a brown duochrome. 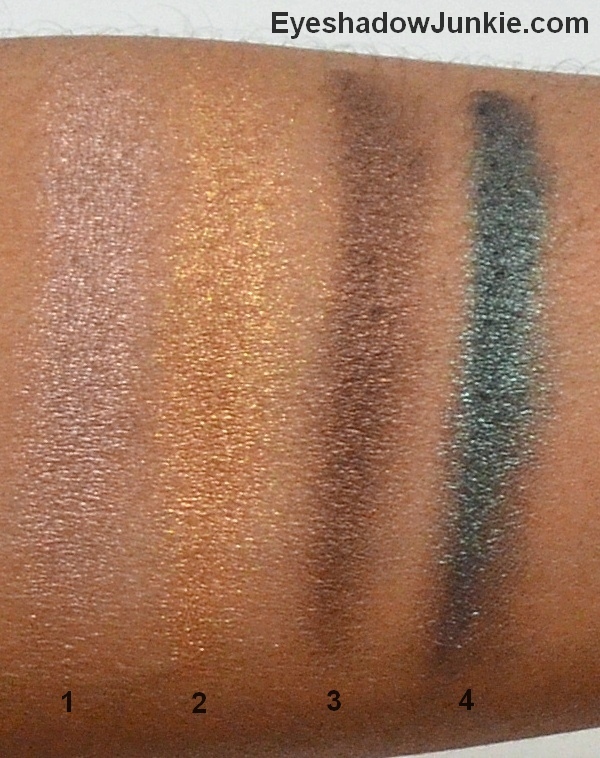 Mac’s Club is a more intense duochrome and the brown is more apparent. The green shines through more for this eye shadow. I find this shade easier to use than Club, which can be tricky. 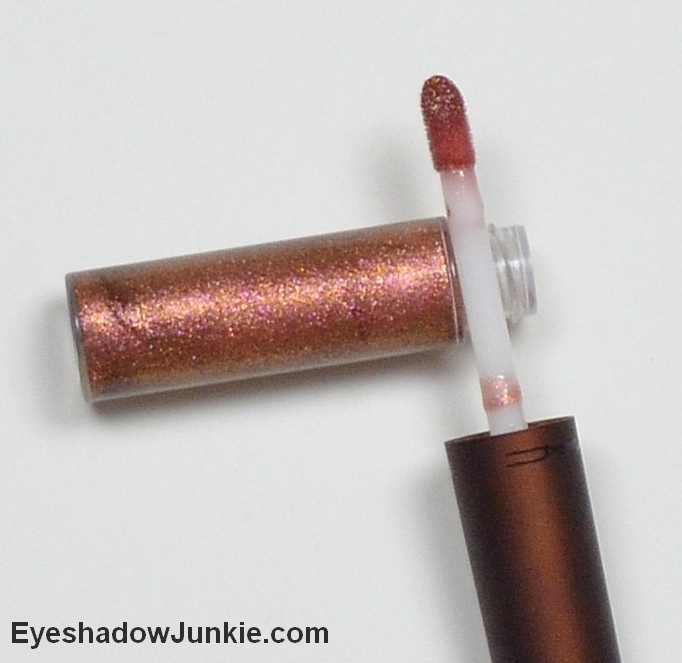 Underdressed ($16.50) lip gloss is extremely sparkly and pretty. It is a medium-light brown base shade with lots of pink and gold sparkle. It is very pretty on its own or layered.